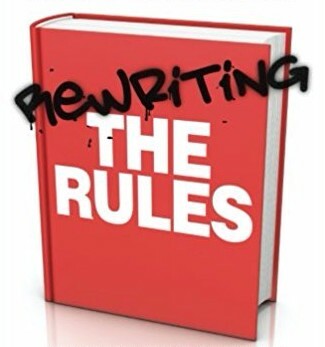 Storify of Rewriting the Rules.. I was in The Metro newspaper this morning talking about making life-changing decisions. The piece was accompanied by this pic which I rather liked – especially the rainbow background. 2. Worry that we will make the ‘wrong’ decision. In the article I try to tackle both these issues. I suggest that it is worth reflecting on the messages we’ve received from wider society, and from the people around us, about what we should achieve in our lives and when. We may have a series of mental checkboxes and feel very troubled if we are not meeting these, or if they are not being met at the times that we thought they should be. Relieving the pressure of shoulds and oughts about what makes a successful life can often help us to go in more fulfilling directions, but this may also involve facing the fear, guilt and shame that can accompany not matching up to the expectations and assumptions that we – and others – have of ourselves. I also talk about something that I have written about here recently: our tendency to polarise and to assume that there are always two possible choices – one of which will turn out to be ‘right’ and one of which will turn out to be ‘wrong’. Such thinking can make decision-making extremely difficult and fraught as we try desperately to figure out which choice is right and which is wrong. We can easily leap to a decision way too quickly, or avoid making a choice entirely (which is still a kind of choice in itself), in order to avoid the pain. Ways forward with this situation are to consider embracing uncertainty rather than grasping for a decision too quickly or trying to avoid it entirely. We can also try to consider all the possible options and to recognise that we can’t predict the future and that there will likely be both positive and challenging outcomes to whatever decision we make. You can read the full Metro article here, and more on the tendency to polarise, and embracing uncertainty, here and here. There is a great piece on dealing with indecision by my friend Ciaran O’Connor here.